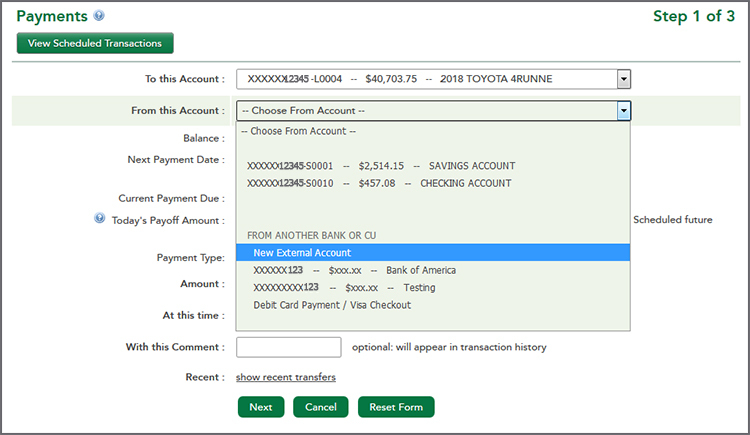 How do I transfer money to/from my account at another Financial Institution or Bank? There are a variety of ways to transfer your money to or from RCU and another financial institution. These include: using "External Transfer" service through RCU Online banking, Bill Pay through online banking, domestic or international wire transfer, Official Check, or writing a check. Note: If you are looking to transfer money from an RCU Account to another person at a different financial institution please review our RCUpay, Bill Pay and Wire Transfer options. You can also make a One Time external account payment. To set up a payment go to Transfer & Payments, then "Payments". 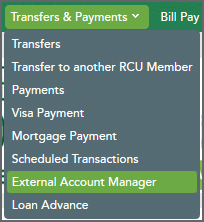 Under "From Another Bank or CU" choose "New External Account". Fill out the account information, amount and frequency. The payment process will take three to four business days to complete. Are there any RCU accounts that are not eligible for the RCU Online Banking External Transfer service? Is there a charge for the External Transfers service in RCU Online banking? How long do electronic transfers take to process in RCU Online banking? 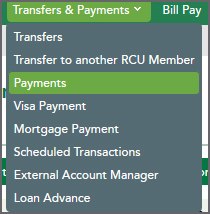 How can I transfer money to and from my RCU account?